True dispeller of darkness and revealer of light. English equivalent of Satguru. A Perfect Master is one who teaches the perfect Knowledge, the knowledge and love of God. Christ and Buddha were Perfect Masters in their own times. Balyogeshwar means Born Lord of Yogis. Paramhans means Highest Soul. Shri Sant Ji Maharaj indicates the present Guru Maharaj Ji. In Hindi, Maha means Great and Atma means Soul. A Mahatma is a great soul who is empowered by Guru Maharaj Ji to reveal the Knowledge. An Apostle. Knowledge is the heart of Guru Maharaj Ji's teachings. In a Knowledge Session, a Mahatma reveals the four techniques of inner meditation, known as Divine Light, Divine Harmony, the Word and Nectar. However, to know the techniques without having the Grace of the Perfect Master is quite useless. The blessings of the Perfect Master. The power which allows us to practice meditation. "Knowledge without Grace is like a car without petrol." says Guru Maharaj Ji. Literally, satsang means the company of truth. 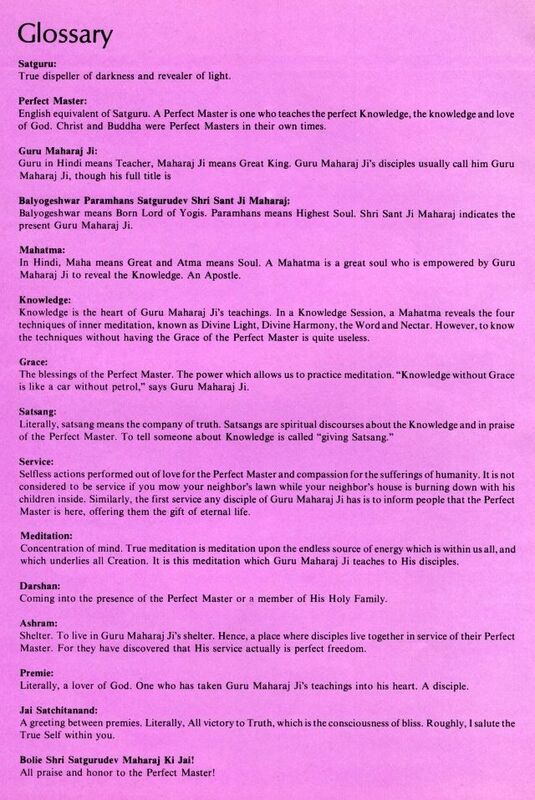 Satsangs are spiritual discourses about the Knowledge and in praise of the Perfect Master. To tell someone about Knowledge is called "giving Satsang." Selfless actions performed out of love for the Perfect Master and compassion for the sufferings of humanity. It is not considered to be service if you mow your neighbor's lawn while your neighbor's house is burning down with his children inside. Similarly. the first service any disciple of Guru Maharaj Ji has is to inform people that the Perfect Master is here, offering them the gift of eternal life. Concentration of mind. True meditation is meditation upon the endless source of energy which is within us all, and which underlies all Creation. It is this meditation which Guru Maharaj Ji teaches to His disciples. Coming into the presence of the Perfect Master or a member of His Holy Family. Shelter. To live in Guru Maharaj Ji's shelter. Hence, a place where disciples live together in service of their Perfect Master. For they have discovered that His service actually is perfect freedom. Literally, a lover of God. One who has taken Guru Maharaj Ji's teachings into his heart. A disciple. A greeting between premies. Literally. All victory to Truth, which is the consciousness of bliss. Roughly, I salute the True Self within you. Bolie Shri Satgurudev Maharaj Ki Jai! All praise and honor to the Perfect Master! * The "Knowledge" is the primordial energy, or source of life. This life force is revealed to people during the Knowledge session and is the inner experience premies mediate upon. * "Satsang" literally means "the company of Truth." Satsang is spiritual discourse about the Knowledge. * A "Perfect Master" is one who is regarded as a teacher of spiritual perfection. * An "ashram" is a monastic living arrangement for those who want to seriously dedicate themselves to spiritual devotion and practice. * "Mahatma" means "great soul" in Hindi. In the Mission, Mahatmas were empowered by Guru Maharaj ji to reveal the source of life which is called the "Knowledge." After the movement became westernized and Indian Mahatmas either were leaving or being demoted, the designation "Mahatma" was replaced by "Initiator." * "Premie" literally means "lover of God" and is a term applied to members of Divine Light Mission. * A "devotee" is one who has surrendered to a guru and to the inner spiritual experience he or she is thought to represent. * The "Knowledge" is the primordial energy, or source of life. This life force is revealed to people during the Knowledge session and is the inner experience premies meditate upon.